At Obra Soft, our specialization lies in offering end-to-end solutions for all your web related requirements. A fully-fledged Website, which is attuned to the latest advancements in IT world, is a prerequisite for developing an identity on the internet. Our technically oriented Developers are credited with producing a diverse range of cross-functional platforms that have shaped the identities of various organizations. 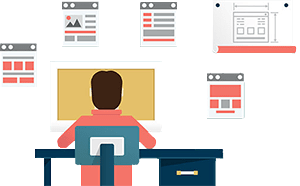 Applying the most sophisticated technologies in developing web applications, our programmers guarantee unmatched user-friendly experience for businesses. Whether you are looking to develop a quality website or looking for experts who can migrate your existing website to a new technological platform, Obra Soft offers you its expert web development services in almost all aspects of web domain. Brochures are simple leaflets describing the products and services provided by a company. As competition across the domain increases, businesses need to take a more aggressive stance to their marketing strategy. Advertising is unavoidable to generate more leads and win more business. For the same, adequate marketing materials are needed. A professional business brochure that showcases your services clearly and impressively can act as an effective marketing tool. Obra Soft provide this crucial concept in our creative brochure designs. our team of writers will fill the design with most compelling content to convince the prospects. Obra Soft offer affordable logo design packages that meet the needs and requirements of the customers spread across different area. Our logo design services majorly focus on providing a separate and unique identity. Success starts with a stellar logo. All logos are custom designed by our skilled and experienced designers. We provide expert advice and opinion to meet the requirements of the clients. A good logo is unique, and not subject to confusion with other logos among customers, is functional and can be used in many different contexts while retaining its integrity. Users often access websites via search engines rather than the web address. Search engine optimisation (SEO) helps improve website content to increase visibility. The process of maximizing the number of visitors to a particular website by ensuring that the site appears high on the list of results returned by a search engine. The higher you rank in a search engine's index, the more visible you will be. This means more visitors, who can be turned into customers. We have a proven multi-step process that ensures your website not just ranks well but also improves the conversion rates. What’s more, our constant optimization efforts will ensure that your website stays on top of organic search ranking for longer periods. Obra Soft offers a complete suite of secure and cost-effective web hosting solution. We provide Best Web Hosting solution in India to manage your web presence. Our dedicated web hosting services help clients build scalable cloud infrastructure using dedicated servers. Why Obra Soft for Web Hosting solutions? Obra Soft Provide a variety of hosting platform operating system options including Windows based hosting and Linux based hosting to choose from. Many ISPs, such as America Online, will allow subscribers a small amount of server space to host a personal Web page. Other commercial ISPs will charge the user a fee depending on the complexity of the site being hosted.